Sorry... got caught up in a wave of enthusiasm over my work on a sonic potato peeler. It's probably better that I set that one aside for now. "The Day of the TARDIS"... or "Who's the Real Star of the Show, here, Anyway?" Well... I suppose I'd better update this "journal" with a new entry, before they start to think that I've just forgotten all about it. But the problem with this project... one of the many problems associated with this project... is that I tend to jump around a lot, in terms of what I'm focusing my efforts on, from one section of the console to another. And also, that each section involves the crafting of a whole lot of fiddly small parts, the acquisition or construction of special tools and jigs, the tearing-down and setting-up for a variety of different procedures... and the ever-increasingly formidable task of simply maintaining my sense of motivation. Plus... it doesn't help that my main work area is set up outside, on my porch, and that it's now almost winter. With the end result of all this being that the whole console ends up always looking unfinished... hardly in any sort of show-able condition. *sigh*... if only it were true... that business where, as in the movies and on tv shows, those stereo-typical folks who work on these kinds of things can somehow whip up complex circuits and structures in a matter of minutes... it ain't true folks! Truth is, "Life... the Universe... and Everything", always does whatever it can to throw obstacles in the path of efforts like this. And, in more ways than one, of course. Naturally, I'm sorry to say that, after an almost infinite series of stops, starts, and other obstacles, I haven't made nearly as much progress on the console as I would have wished. But I am happy to say that my progress in tooling-up for the task has taken some major strides! After the addition of my G8689 Mini-Mill from Grizzly Industrial, I have finally acquired and begun the set-up of my new Lathemaster 8x16 bench-top mini-lathe! Once the tramming and leveling is done, on the benches I built for these machines long-overdue from my life, the next step is to get set up with all the basic accessories needed for getting started. Then, hopefully, once I've gotten some experience and run through a couple of projects, I will be able to attempt reinitialization of the regular submission of some reviews and articles to this blog. Of course, both the mill and the lathe originated in China. Sad to say, I'm still too poor to have been able to afford any other option. And I would suppose that this is true of many of the truly "small-but-hopeful-businesses" ( the ones earning considerably less than one-hundred-million dollars a year! ) just starting out. Then, later on, if success ensues, the acquisition of pricier American-made tool-works can proceed. This is the useful advantage of those Chinese goods. What they sometimes lack in quality and finish can usually ( hopefully ) be made up for with the small-businessman's ( or hobbyist's ) application of elbow-grease, and time. And the price is right, and that can only help the small concern ( or the budding craftsman ) to get going. Anyway... I suppose,then, that I'd better buy what I need before some potential future president decides to get "tough with China". With that title, of course, referring to Igor's famous "hump" line, and also the recent "workout" photos released by Paul Ryan for the apparent purpose of impressing female voters. 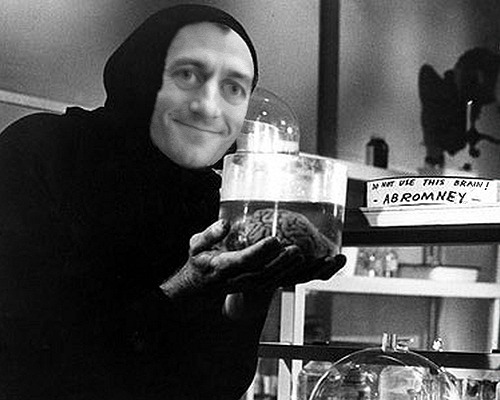 With apologies to the late and great Marty Feldman. Current Location: Drifting toward the outer reaches of my Mind. Current Music: just some peace and quiet, please. Season's Greetings!!!... from The Steampunk Console Project! Despite my not having posted anything useful, here, in quite some time... I actually have made a fair bit of progress on this project over the past several months... mostly thanks to the acquisition of some shiny new shop tools! But... more about that later. For now, here's wishing everyone a Merry Christmas, and a Happy AND Prosperous New Year!!! Current Music: the original theme music from "Dungeon Siege"
A break? From what???... as if I've been actually doing anything! Well, actually, I have. Which I will now waste a little bandwidth in trying to explain. ... but not just any ol' tv... no! I've been watching "Fringe". Which, without a doubt, is my favorite TV series, now. The entire cast is great!... but, I would have to say that the lion's share of the credit-pie ( naturally, I would have to express it in terms of food ) would have to go to John Noble, for his wholly convincing portrayal of the quirky "mad" scientist, Walter Bishop. Certainly, the actor's dramatic flair has given his role a depth of character such as is seldom seen in many, if any at all, "real" scientists, these days. It might, therefore, just possibly be... that "Walter Bishop" is the most immediately recognizable "scientific" figure of today. The series is guilty of lab-equipment abuse. Especially the volumetric flasks! You see it in every episode... Volumetric flasks set to boiling some strange colored liquid atop a Bunsen burner... with bubbling-jacketed glass-jointed condensers, not even made to fit, jammed into the top... with lengths of plastic tubing stuck down the neck for even more bubbling of unknown gases through yet more oddly-colored liquids... Desiccators! Half-filled with yet even more strange liquids!... and on and on and on... Oh!... Cruelty to Corning-ware! Well that, at least, has prompted me to return, for now, to 3D-rendering as a pastime. With my current project being that of looking into a possible 3D re-creation of Walter's lab. Someone, it seems, has to show them how it's done. The Steampunk Console Project - A New Render, and MORE... such as "Why is this taking so LONG?" The full image is 1280 x 1024 pixels and is shown, here, reduced in size. And, unfortunately, as a jpeg image, which reduces some of the detail. But, just click on the images to move up to the full size. The Steampunk Console Project - an Update... no, really, an Update... sort of. I've actually been meaning to do this since February. And it only took me two full seasons to get around to it! 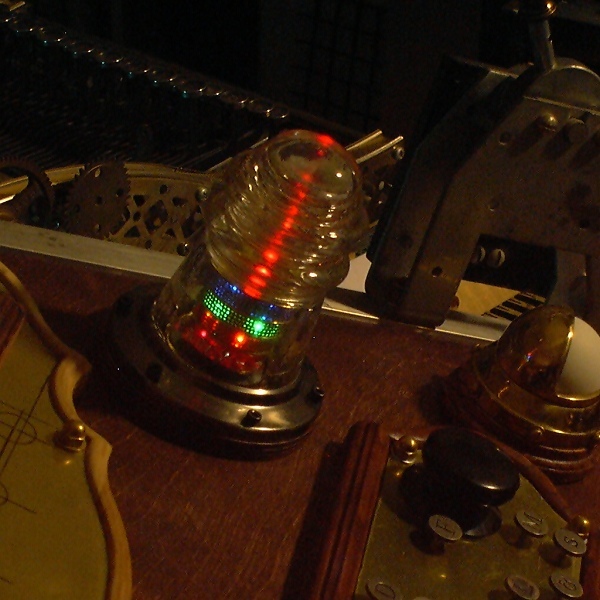 The Steampunk Console Project - Steampunk Keyboard , an Update, Crimefighting, etc. Current Location: Did I wake up today in that "Fringe" parallel Universe? A Steampunk Keyboard for the Steampunk Console Computer? ... and another sneak preview beyond the LJ cut! Ack! I go into the next room to take a short nap... and already it's the end of August!!! No doubt about it! Something evil is stealing time from me!! "You got that right!" says a sinister sounding voice, coming from somewhere behind me. ...based upon a true story! First, I would like to apologize, to all those who have been kind enough to leave a comment, for my singular lack of exertion in maintaining this journal account. Though I cannot promise that this will change, I will try, at least, to make up for it by being more forthcoming in details in what I do report. For the rendered image in the previous journal entry... well, it's a twelve-hour render, and I have not made any improvements... but I have uploaded a full-screen image to allow better viewing of details. Just click on the image below to link to a mid-size image. Then click on that image to be taken to a 1280 x 1024 view ( after you click with the little "magnify" cursor ). Eventually, I'm hoping to release the content that produced that image... free to anyone who might want to use it... or parts of it... in their own 3D renderings. One stipulation, though. It will be in Caligari ".scn" format, in remembrance of dear ol' Caligari trueSpace... recently executed by the good folks at Microsoft, for the crime of having fallen below the bottom-line. ... so you will have to have access to a copy of trueSpace 6.6, at least, to open the file ( or an application that can read Caligari files ). ...which, in the render, you see is not visible. Which is because it will ( if this works out ) likely be the most complex part of the whole machine. Since the computer ( and it's associated network of micro-controllers ) will be the main engine behind this system... why not design it rather like the engine of a... um... "hot-rod". That is, with the engine exposed. Open-frame. I can't believe that it's been more than four months since I've added anything to this journal account. Though some small progress has been made, it's not been nearly as much as I'd hoped. It just seems that whenever I attempt anything like this, a thousand obstacles and distractions begin coming from every direction. And, of course, it's just like that for many of us... but it still shouldn't be. Hopefully, I can give an account of what I have done within the next few ( or several ) days. For now... here, at least, is a preliminary 3D rendering ( in trueSpace ) showing something of what this project may... eventually... end up looking like. Well... maybe not the room. But as for the console itself, most of the electronics, materials, and hardware have finally been acquired.